Dr. Michele Gasper with Albert. An upset stomach is no fun for you or your kitty, but knowing which foods to give cats with gastrointestinal problems can help your pet feel so much better. A vet who specializes in feline medicine weighs in on how to soothe your cat's tummy so you'll both be happier. LoveToKnow was pleased by the opportunity to interview Dr. Michele Gaspar. Dr. Gaspar is a board-certified feline specialist (Diplomate of the American Board of Veterinary Practitioners) and a consultant on the Feline Internal Medicine Board of the Veterinary Information Network (VIN). 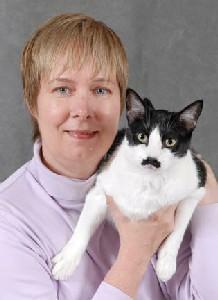 As a VIN consultant, she helps veterinarians world-wide deal with some of their most perplexing feline cases. Dr. Gaspar is also a 2000 graduate of the veterinary acupuncture course at Colorado State University and is currently enrolled in the advanced Traditional Chinese Veterinary Medicine course at the Chi Institute. According to Dr. Gaspar said, "As a Reiki practitioner, I use an integrative approach to my feline patients, incorporating Western medicine and diagnostics, as well as acupuncture, nutritional therapy and referral for chiropractic care, as warranted." Dr. Gaspar, what are the signs we should look in cats that have gastrointestinal problems? Cats with intestinal disease have a wide range of clinical signs. Weight loss, despite a normal or increased appetite is very common. Cats that are chronically ill usually have a loss of fat over the spine (so that the spine is palpable). Other cats have routinely vomit food, fluid and/or hairballs. Contrary to what many pet lovers believe, hairballs are not normal in cats, and they are not due to a "grease deficiency". As a result, I do not recommend the use of over-the-counter "hairball remedies" or "hairball diets." Other cats with gastrointestinal disease have diarrhea or constipation. Still others have reductions in their normal appetite, or do not eat for one or more days. Because the clinical signs of cats with intestinal disease are often similar to those of other diseases (chronic kidney disease, urinary tract obstruction in male cats, chronic progressive kidney disease, diabetes and hyperthyroidism), it is important to promptly seek a veterinary examination and evaluation for your cat or kitten. With most gastrointestinal diseases, lab work and a urinalysis is most often normal. However, normal lab work does not guarantee that your cat doesn't have a problem. So, what are the best foods to give cats with gastrointestinal problems, or at least help cats avoid a problem? Most knowledgeable veterinarians now recommend a predominantly canned food diet for cats. When we think about the foods that we should feed our cats, we need to remember that our domestic cats are descended from cats that developed in the deserts of North Africa and the Middle East. As such, they are carnivores whose primordial, low carbohydrate diet consisted of birds, rodents and lizards. As desert dwellers, our cats are also "designed" to get their water/moisture from their foods. Dry food, although convenient for the cat guardian, generally provides too many carbohydrates and no moisture for our cats. Since cats require taurine in their diet as an essential amino acid, I recommend a balanced poultry (chicken or turkey) or rabbit canned diet. Cat guardians need to read labels carefully. I generally recommend Evo canned (although it does contain a very small amount of fish), Nature's Variety Instincts line and Nature's Variety Organic Raw Frozen diet as a cooked diet. I do not recommend raw diets for cats, especially those with gastrointestinal issues. This recommendation comes from my work with Traditional Chinese Medicine and food therapy. 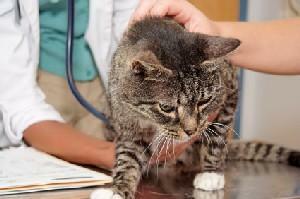 Are gastrointestinal problems more common in older cats? Cats of any age can have gastrointestinal disease. Generally, younger cats respond more favorably to a diet change, but I try to convert every patient in my practice to a better diet. Proper nutrition is a cornerstone of feline health. While I can't change the genetics of my patients, I can work closely with the client to make sure that they are feeding an excellent diet. It's important to realize that cats must eat well everyday and enjoy their food. Cats can and will starve themselves with disastrous outcomes, so it's very unwise for cat guardians to assume that a cat will eat a food he or she finds unpalatable. Any food change should be done gradually, generally over a period of 7-10 days, although some cats may need a longer time frame. Are there any breeds that are more prone to stomach distress? Any cat, whether purebred or not, can develop gastrointestinal disease. In my clinical practice, Siamese and Rex cats seem to be effected more frequently. This most likely is due to the genetics of gastrointestinal disease. How does a cat's diet impact gastrointestinal health? There are several theories regarding diet and gastrointestinal disease. Some believe that chronic exposure to food allergens elicits an immune response in the intestinal tract and starts an inflammatory cascade. Others theorize that diet can adversely impact the normal bacterial population, which can drive inflammation. Are there any symptoms that indicate a more serious problem that requires an immediate trip the vet? A combination of these signs should prompt the cat guardian to seek the help of a veterinarian. Remember that cats tend to hide their illnesses, so cat guardians need to be vigilant. What specific diet do you recommend for cats with GI disease? It's important to take an accurate food history and to avoid any protein sources and carbohydrate sources that the kitty has eaten in the past. I tell most of my clients that they cannot feed their cats appropriately with foods off the grocery store shelves. Avoid foods with what I can only describe as having "funky shapes and colors." Avoid sliced products (generally too many carbohydrates, as well as foods in bags and/or boxes). Aim to feed a diet that is seven percent carbohydrate or less. I'd use more of the hypoallergenic diet as treats. Most OTC treats are filled with corn, soy and wheat gluten. Any tips for relieving the symptoms? Clients often erroneously believe that symptomatic treatment (steroids, antibiotics) is often a less expensive way to proceed. However, gastrointestinal disease can be complicated. There are many types of GI disease, and treatment differs between the types of disease. Intestinal disease in cats is often concurrent with pancreatitis and liver disease. With a proper diagnosis and therapy, most cats do well with their intestinal disease. Intestinal disease is quite common in our domestic cats and affects cats of all breeds and ages. A proper diagnosis is critical. Diet can play an important role in managing intestinal disease in cats. I can't stress enough that hairball vomiting (or any vomiting, for that matter) is not normal. As I often tell clients: God didn't create a vomiting species!